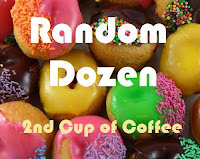 It's time once again for a Random Dozen! Click on the doughnuts to see Linda's blog! 1. How do you feel about "Gladiator" sandals, also called "Roman" or "Jesus" sandals? A fashion yea or nay? 2. What is your favorite pizza? 3. There are plans in the works to sell roughly 1,000 items from Star Trek: The Experience in Las Vegas. This means you could buy Picard's chair for your family room. If not a Star Trek item, what prop, background, set, etc. from what TV or movie would you buy if you could? Considering my 17 year old daughter recently asked me to glue on her Spock ears, I'm guessing anything remotely connected to Star Trek. I see a comic book convention and a son-in-law dressed like a Wookie in my future. 4. Name a local food or restaurant that your area is famous for. We have Ronie's. And then there's Connie's. Oh, and The Swamp. All three had Sunday breakfast buffets. The Swamp even has a guy who walks up and down the median of Main Street, holding a sign that says "$9.99 Breakfast Buffet at The Swamp" He usually has the arrow pointing in the wrong direction. 5. What is your current favorite snack? How about "Surviving a Dance with a Big Loser"? 7. On a scale of 1-10, with 1 being uninhabitable and 10 being cleanliness that meets the standards of OCD, how clean is your vehicle's interior? 8. It doesn't feel like Spring until _________. 9. Something that made you laugh really hard recently is ____. my 15 year old son came into the kitchen, and poured himself a huge bowl of cereal right before dinner...me: son, we're about to eat dinner. him: *sigh* I'll eat that too. 10. Tell me about a goal you're working toward. 11. Share a thought-provoking or inspiring quote this week. 12. Name one thing that you do as a parent that you absolutely know will make your kids happy. If you're not a parent, feel free to substitute "friend" or nomenclature that works for you. How cool to be first! Great answers!!! What fun answers. See your not the only one up after midnight...lolol. Glad you joined us this week. It also pays to have insomnia to be able to read something this good in the middle of the night! GREAT answers, thanks for playing! Good answers! I laughed at #1 just imagining my Grandma in gladiator sandals is too funny. Great answers. Loved the Grandma in gladiators mental image! Wow, you're #1! Your answers are very creative, especially #6! Your answer to #9 sounds like my house! Have a good day! I LOVE #9 - my 13 year old son personified! If he ever grows into all he's eating (and mind you, at 13 he's already 5'10"), he'll be too tall for most doorways! My word verification is "ingrate" which is what I feel like -- I'm glad my son is healthy. Silly me! Claritin is my friend too these days...enjoy your day! #9 teenage boys will eat you out of house and home. I love the answer to the show you would be on! I bet I would win that show as well! Also love what made you laugh. I have a 17 year old who does the same things. Love your answers, especially this one "How about "Surviving a Dance with a Big Loser"?" Hey Deb! Did you see where I put your blog on my left sidebar? You'll have to check it out! ~ Thanks for making me laugh! ~ Your son sounds like my husband. He'll say he needs a little snack before dinner and proceed to make a hotdog with all the dressings! That's a whole meal for me! Blessings to you! The Swamp??!! Love your last one. So true. They mainly want us to look and act like moms!! Fun answers! Loved the one about Claritin! Hi. Visiting from the Random Dozen today. I enjoyed reading your answers. #10 - Midnight? That's early for me! great idea for the reality show!! Now that would be "real"ity! lol I don't try to act like my 17 year old either and she appreciates it. I am my natural crazy self no matter what lol!! snack....my any kind of popcorn??? Now you have me wondering. I guess I don't read enough ingredients.